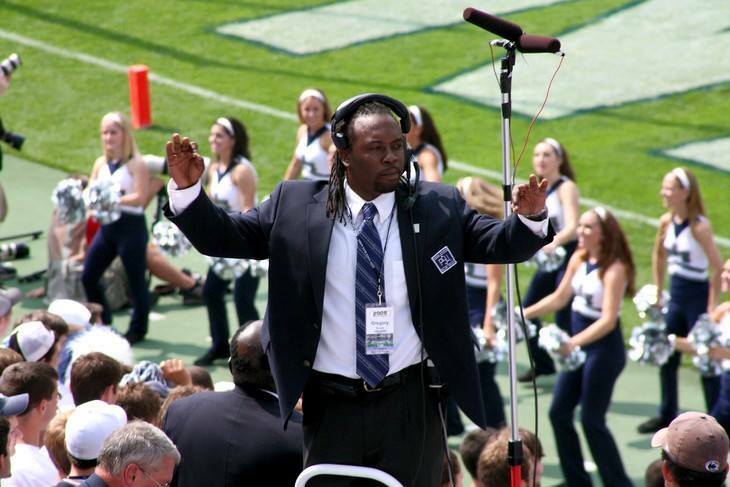 1) Congratulations on being named the Director of the Penn State Blue Band. What was your initial reaction to hearing the big news? My initial reaction was, WHAT TOOK SO LONG?!?! In all seriousness, I felt overjoyed, humbled, honored, excited, and relieved all within 30 seconds. I know how much this organization means to so many people. I am grateful to be entrusted with such a great responsibility. Right now I am focused on completing the team of band staff that will be working with me. There are some people who worked with Dr. Bundy, so right now I am working on retaining them and also adding new member to our band staff team. With regards to the structure, there will be some differences. We have evolved from being just the 300-member Marching Blue Band to include a 160-member volleyball pep band and 180-member basketball pep band. For many years, I was responsible for developing those pep bands along with graduate assistants. With so many students involved in the Penn State Athletic Bands program I expect all staff to contribute to those groups as well. 3) Blue Band fans have always known of your shows to include more "moving pictures" in the drill. Especially since you guys go head to head with the Ohio State Band every year, can we expect more of that throughout the season? I believe that you can continue to expect great visual interest in addition to our GREAT musical arrangements with the PHENOMENAL BLUE BAND sound! 4) What type of style or attitude are you hoping the band exudes under your leadership? Being with the band for over 10 years now, I believe that the band has absorbed some of my attitude towards making music and my enthusiasm for marching band. I am always smiling because I get to make music with the one of the best collegiate bands. I have an UNRIVALED (see Penn State Football branding) passion for music. Also, I love rehearsing because that is where the magic happens and we grow as a band. Therefore, I hope to create an atmosphere where the band members share my passion for rehearsing. I believe that performances are just a by-product of the hard work we put into rehearsals. I expect for the Blue Band to continue to perform entertaining shows...PERIOD. I can not say exactly how that will look at this time. But what I do know is that the music and the sound of the band will be the TOP priority. I believe all of the additional elements of bells and whistles are just that, additional elements. We will ALWAYS first start by creating a great show with solid music that can stand alone and then look to add enhancements, not the other way around. 6) The Blue Band is such an important part of the Penn State football experience, we saw Coach Franklin congratulate you on twitter when you were named Director, how is the relationship between the band and the athletics department and what more do you hope to build in terms of opportunity for your students? We have a great relationship with Penn State Athletics and the coaches/teams that the Penn State Athletic Bands bands play for. Every summer I meet with Coach Rose (women's volleyball), Coach Washington (Women's Basketball) and Coach Chambers (Men's Basketball) to discuss how the band can enhance its contribution to the game day atmosphere at each of their sports. Coach Franklin has been very busy this last year but I hope to schedule some time with him this Summer. Whenever I speak with the coaches and Athletic representatives, I remind them that the band students are essentially volunteers who show up early and leave late to EVERY game. These students can be doing anything else but they chose to donate their talents to Penn State. I believe they should be celebrated. Therefore I ask that each coach acknowledges the band student's contributions every opportunity they get to do so. 7) The Blue Band alumni are a huge group and very loyal. How have they received the news so far and what are looking forward to most in working with them? I am REALLY looking forward to working with the alums. I have heard from so many alums via Facebook, Twitter or in person and many seem excited that I was selected as the Director. However, I am looking forward to working with our former Blue Band members. So many of them have gone on to do great things and have experiences as entrepreneurs or in the corporate world. I am hopeful that they will contribute their expertise to our Alumni Band association. 8) Dr. Bundy was known for some great one liners. What are some expected pre-game speech one liners we could potentially hear from you that will grow into Blue Band lore? For now, I plan to plagiarize our beloved Dr. Bundy. 9) What do you foresee will be your biggest challenge as Director? What are the coming challenges of the band in general that you expect to deal with? Honestly, I foresee my biggest challenge as director is that most people assume that I will do things just like Dr. Bundy. I have worked with him for many years and there are many things that I will do in a similar fashion. However, I know that I can not be Dr. Bundy, he is a legend in our field and I will not try. I can only be Greg Drane. The biggest challenge we are facing is that we have 5 home games in a row to start off the season for a total of 7 home games, in addition to traveling to 1 away game. That would be a huge undertaking for a veteran staff. This will be a GREAT challenge for us as a new team with new leadership. However, I am extremely confident we will face this challenge head on and succeed. 10) Your son Deuce is already a viral marching band sensation. Can we expect to see him used in halftime shows this season? Have you given any thought to letting him suit up one game and march with the band? My 3 year old son Deuce Drane BELIEVES that he is in the Blue Band. If it were up to him he would march out of the tunnel. I have not thought about him being included in a show but I certainly think about it now.